The Midvale Cottage Post: Buy Your Vintage Sewing Patterns During the Holiday Shopping Sale! Buy Your Vintage Sewing Patterns During the Holiday Shopping Sale! Have you been stashing some cash? The sale of the year is almost upon us! As a member of the Pattern Patter team on Etsy, my Midvale Cottage shop will be participating in this weekend's holiday shopping sale extravaganza! Beginning Friday, November 28 (at the stroke of midnight), until the end of Cyber Monday, December 1st, (at the stroke of midnight), everything, and I mean EVERYTHING, in my shop will be 20% off! And if you don't find what you want, be sure to check all the participating shops, as most are offering discounts as well. 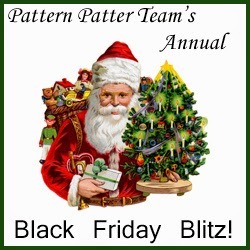 On the days of the sale, just click this image to view all the pattern shops that are participating and the fresh items they are adding to their shops for the event. You can peruse my items at any time by visiting Midvale Cottage on Etsy, or on this special Etsy on Sale link that goes live during the sale period.